I ended up saving my money for a couple of months so that I could have the photos mounted at KodakGallery.com. They were running a 2-for-1 special for anything on their site, and these 11x14 wood panels with black edges were a steal at $35 for two of them. The boys LOVE them! They only want to know why Jake couldn't have been a part of it. Maybe next time! 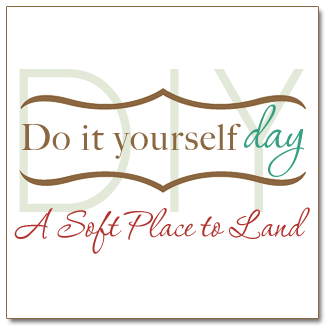 Many thanks to Kimba at A Soft Place to Land for hosting DIY Day! They are gorgeous. I think I might try it out with the word FAMILY - as there are six of us. LOVE IT! These turned out soooo cute! So stinkin' cute!!!!! Oh Caroljane! There are six of us also! FAMILY. Great idea. Of course my kids names actually spell out DaMaGE...how appropriate is THAT! What a great idea! They turned out so cute. Adorable! What a fab idea!! Thanks for sharing! They turned out great! Thanks for sharing the idea! This is REALLY cool. What a clever idea to have them IN the art. I'm impressed. That is a very cool project! Love it! Thanks for stopping by by Blog. I signed up as a follower, I hope you will do the same. I absolutely LOVE these! What a great idea...and what a great price...I'll have to wait for another sale, because usually it's way too much. Super cute! I love love love that idea! So, so cute! I did something similar as a gift for my hubby this past Daddy's Day. Love it. I know a little Jedi who would go nuts to have this hanging over his bed! That's really cute. Thanks for stopping by. What a fabulous idea!!! It turned out so great. I'll bet you are super happy with it now. This is so amazingly cute! I absolutely love the idea...thanks for sharing! I appreciate everyone's comments and am very impressed that people are thinking of their own words to use for this project! I especially love "family." Very cute and creative! I bet they love it. Thank you for the compliment on my Star Wars mural. It's not as hard as it looks. Feel free to send me an e-mail with questions (if needed) if you do tackle something like that. Thanks!